I did a very straightforward (naive) import of this data into Couchbase. Each row became a document in a “staging” bucket. Next, we must decide if that JSON data modeling design is appropriate or not (I don’t think it is, as if the bucket being called “staging” didn’t already give that away). Note that in this example, the “child” documents point to the parent via InvoiceId. But it could also be the other way around: the “parent” document could contain an array of the keys of each “child” document. 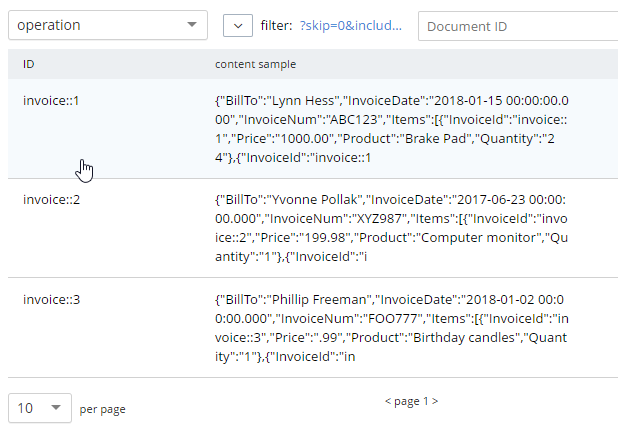 Note that “InvoiceId” is no longer present in the objects in the Items array. This data is no longer foreign—​it’s now domestic—​so that field is not necessary anymore. Therefore, “nested objects” seems like the right design. Please remember that these are not hard and fast rules that will always apply. They are simply guidelines to help you get started. The only “best practice” is to use your own knowledge and experience. First, create a “operation” bucket. I’m going to transform data and move it to from the “staging” bucket (containing the direct CSV import) to the “operation” bucket. Next, I’m going to mark the ‘root’ documents with a “type” field. This is a way to mark documents as being of a certain type, and will come in handy later. I know that the root documents have a field called “InvoiceNum” and that the items do not have this field. So this is a safe way to differentiate. This is just prepending “invoice::” to the value. Note that the root documents don’t have an InvoiceId field, so they will be unaffected by this query. The invoice items should now be nested into an “Items” array within their parent invoice (I collapsed them in the above screenshot for the sake of brevity). Once you’ve verified this looks correct, the data can be moved over to the “operation” bucket using an INSERT command, which will just be a slight variation on the above SELECT command. FOR i specifies the left hand side of the ON KEY join. This syntax is probably the most non-standard portion of N1QL, but the next major release of Couchbase Server will include “ANSI JOIN” functionality that will be a lot more natural to read and write. After running this query, you should have 3 total documents in your ‘operation’ bucket representing 3 invoices. @mgroves on Twitter. You can also ask questions on the Couchbase Forums. There are N1QL experts there who are very responsive and can help you write the N1QL to accommodate your JSON data modeling.